Given the considerable amount of time most employees spend at work, the foods they eat during the workday play a vital role in their overall nutrition and health. Think about the eating habits you notice among employees in the breakroom or work stations. Do most employees pack nutritious lunches? Do many order food in or go out for lunch? Do you often see employees eating fruit and vegetables? By fostering an environment and culture that encourages healthy eating, healthy choices become easier choices to make at work. Since September is fruit and veggie month, now is a perfect opportunity to promote eating more fruits and vegetables in your workplace. 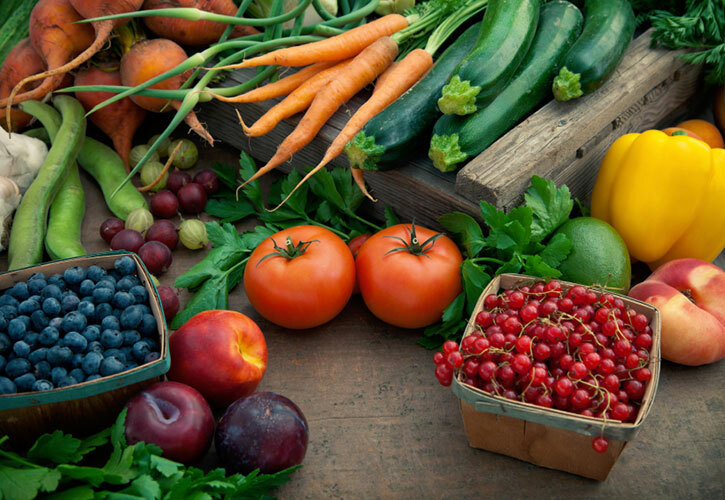 A diet rich in fruits and vegetables can help reduce the risk of heart disease, stroke, cancer, and many other health conditions, which in turn can save money on healthcare or insurance costs for employers, increase productivity, and lead to happier employees overall! What can I, an employer, do to promote fruit and vegetables at work? Offer fresh fruits and vegetables in cold vending machines and/or cafeterias for employees to purchase. Price fruits and vegetables at lower prices compared to non-nutritious foods to make them more appealing. Encourage choosing fruits and vegetables by supplying them for employees to try as a tasty and easy snack. For example, place a fruit basket in the breakroom. Create a policy that requires fruits and vegetables to be served as a food option at company meetings, conferences, and events. Offer employees the option to join a Community Supported Agriculture (CSA) organization and receive deliveries at the workplace. Implement a fruit and vegetable challenge to encourage employees fill at least half their plates with a variety of fruits and vegetables at meals. How can my organization help raise awareness about fruit and vegetables at work? Offer workshops or cooking demonstrations to teach employees different ways fruits and vegetables can be prepared or included in healthy recipes. Inform employees of the dates and times of local farmers markets. Post flyers or nutritional information of various fruits and vegetables. Include the many benefits they can provide. Partnering with the right wellness platform, such as Well Nation®, can also have a significant impact in positively impacting your employees’ eating habits and overall health. With convenient targeted nutrition wellness coaching, individual and corporate healthy lifestyle challenges, and a healthy habits tracking and reward system, Well Nation® offers a suite of comprehensive and easy-to-use resources to improve eating habits and promote overall healthier lifestyles.